In a complaint (PDF) filed in Nevada against Goldman Sachs last year, the city of Reno states that it issued $73.45 million of Auction Rate Securities (ARS) in 2005 and $137.43 million ARS in 2006 on the advice of Goldman. Like many other municipalities, Reno subsequently saw the market crash in 2008 and yields skyrocket, leading to a $9.6 billion loss for issuers. The ARS structure was promoted by Goldman as liquid, cash-equivalent investments that would allow Reno to borrow money for long term projects whilst taking advantage of short-term interest rates. In our paper, Auction Rate Securities (PDF), we explore why ARS are in fact long-term floating rate bonds with a superficial similarity to short-term investments. In order to determine the interest rate, periodic auctions are held where buyers and sellers place their bids. The resulting market clearing coupon rate is paid by the issuer on the entire issue of ARS until the next auction. The complaint states that “unbeknownst to Reno…prior to February 2008, Goldman always placed a bid in every auction to prevent auction failure.” In the months leading up to the financial crisis, auctions started failing as market participants increased their assessment of ARS risk. 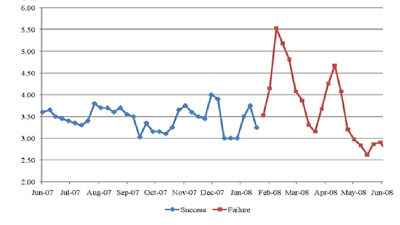 On February 12, 2008 Goldman ceased to artificially support the municipal ARS market causing more than 50% of auctions to fail. Interest rates spiked sharply and auctions cleared above short-term market rates, usually at or even above long-term fixed rates resulting in unprecedented losses. 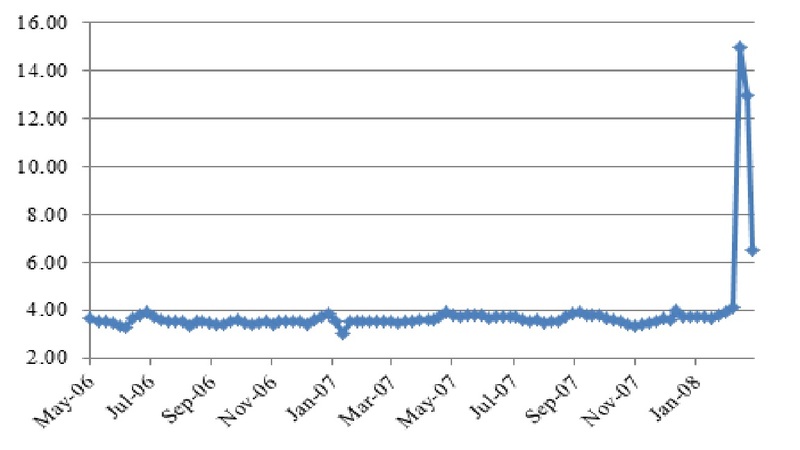 As an example, the following figure shows that the weekly auctions of ABAG Finance Authority’s ARS, which started failing in February 2008 and has failed consistently since June 2008. 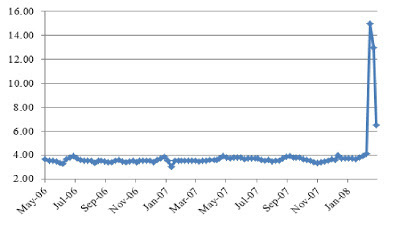 The ARS issued by Reno in 2006 with Cusip 759861AY(3) had rates of 3 to 4% until February 2008 when the rate dramatically increased-- reaching 15% in February 2008. In February 2008, Reno was forced to rapidly unwind its 2006 position and refinance its ARS thus incurring an early termination obligation of over $8 million.